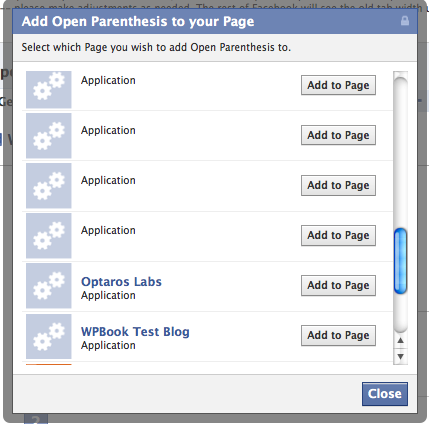 WPBook allows for the addition of tabs Facebook Pages. (Facebook no longer allows applications to add tabs to individual profiles). 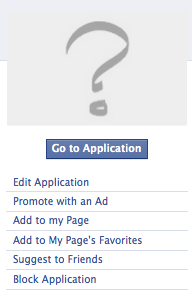 Go to your Facebook application’s “About” page. (The easiest way to find this is to go to the application itself, and click on the application name at the bottom where it says “Page built by”). Click the “Add to Page” button next to the page you’d like to add to. You won’t likely see anything happen, though the page for which you clicked the button should disappear from the list. Click the “Close” button when you’re done adding to pages. (For each page you added the app to . . .) Go back to the page to which you added the app, and click on “edit page” in the left column under the page’s logo. While looking at the page in edit view, find your application in the list of applications on that page. Click on the “edit” link associated with your application. You should be taken to a page which thanks you for adding the app. The act of adding the app should also have automatically added an application tab to your Page’s profile. 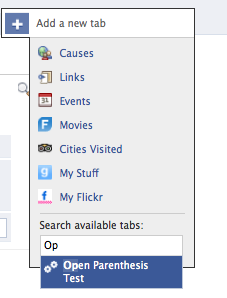 The tab name is taken from that supplied on the Profiles tab of the Facebook application settings.